Reaction Time - This experiment also explains the difference between reactions and reflexes. Reflexes require no thought. They are automatic, fast, and of huge importance to a human's ability to successfully respond to their environment. Despite the magnificent information-processing power of the billions of neurons in our brain, we need a lot of stuff to be done automatically. Without reflexes, our brains would be overloaded with worrying about constantly updating the position of our unstable bodies to keep us upright. Without reflexes, our ability to engage in complex thought (black holes, neuroscience, what to do this weekend, how do I make an instrumented reflex hammer?) would be limited. Without reflexes, your reactions to painful stimuli would require thought, and... don't take it personally.. but you think very slowly... Don't feel bad, all humans are slow thinkers, and we need more speed to respond to dangerous painful stimuli. So we let our spinal cord do that fast work for us. One example of a reflex is the patellar stretch reflex. Our spinal cord partners with sensors in our muscles, called muscle spindles, to keep track of where our bodies are in space and how stretched or contracted our muscles are. The way that these sensors interact with our spinal cord is through a reflex pathway. Stretching the muscle activates the muscle spindle at the end of the sensory neuron (embedded in your muscle) and starts the reflex. 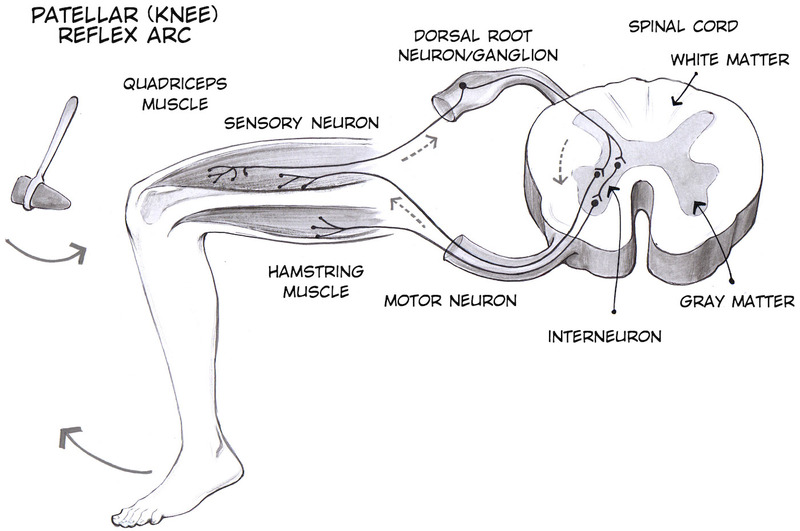 The reflex is to prevent over-stretching of the muscle and compensates with a contraction. As you can see, there is only one connection (a synapse) needed for the information from the sensory neuron to get to the motor neuron and cause a muscle contraction. Because of this single synapse, this can happen very fast. In a young, healthy person, it takes 15-30 milliseconds for the stretch stimulus to produce a muscle contraction, by comparison, it takes 5-10 times that long to blink your eye in responses to a stimulus, or 150-300 milliseconds. This is super useful for correcting your muscle length in response to rapid changes such as a slip or trip. These situations require very fast corrections to prevent falling and injury. If you had to consciously flex your leg in response to the leg stretch (a reaction) it would be much slower than the 15-30 seconds of reflex. Now let's try to measure this reflex! And perhaps let's measure a reaction too! 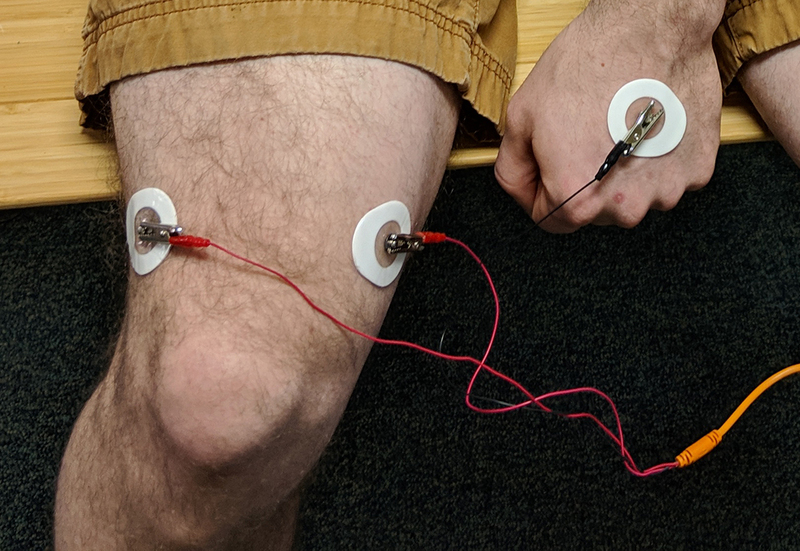 For this experiment, we are going to look at the electromyographic signal in the rectus femoris muscle, one of the muscles in the quadriceps femoris group. We elicit a reflex using a tap to the patellar tendon. This is the same test that is done when you go to the doctor's office (the doctors use it as a quick test to determine spinal pathway health - problems can be symptomatic of neuromuscular diseases). Set up your Muscle SpikerBox Pro using a smartphone or computer with the Spike Recorder app. Connect the USB cable from the Muscle SpikerBox Pro to the computer. Open Spike Recorder, and turn on your Muscle SpikerBox Pro. A USB icon should appear on the main SpikeRecorder screen. Click on it to connect to your Muscle SpikerBox Pro. (Note: If you are using a tablet, smartphone, and/or a Regular Muscle SpikerBox, you can connect to your tablet/smartphone/computer with the green smartphone audio cable. Have the subject sit on a sturdy surface high enough to allow their lower legs and feet to dangle freely. Have the subject contract their quadriceps (knee extensor) muscle so you can place two on either side of the knee as shown in below. 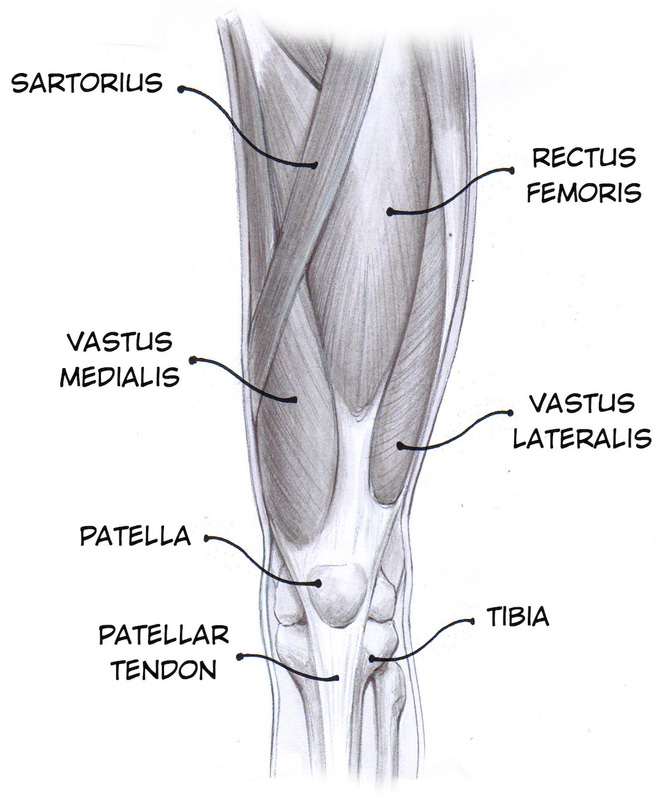 One electrode on the Vastus Medialis, one on the Vastus Lateralis. Place a ground adhesive electrode on the back of the hand. 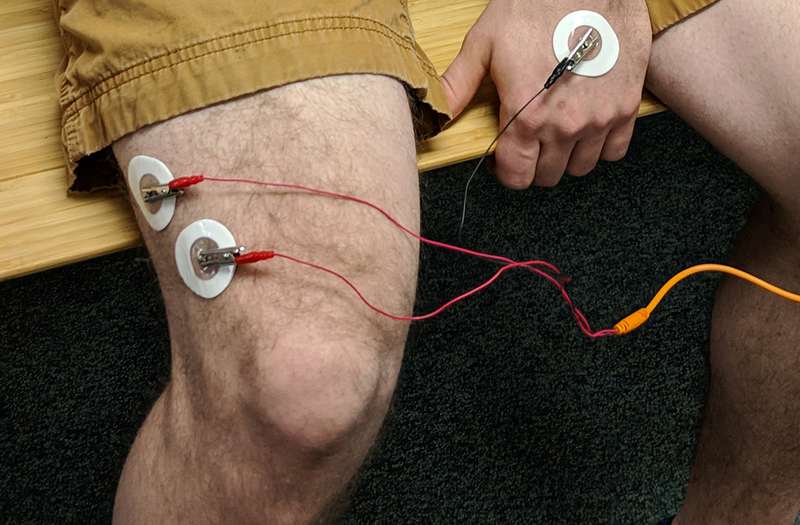 Clip the red leads of your orange muscle cable of the electrodes on the muscle of your thigh, and the black lead on the ground on your outer palm. Getting a good quality muscle signal is really important for this experiment. 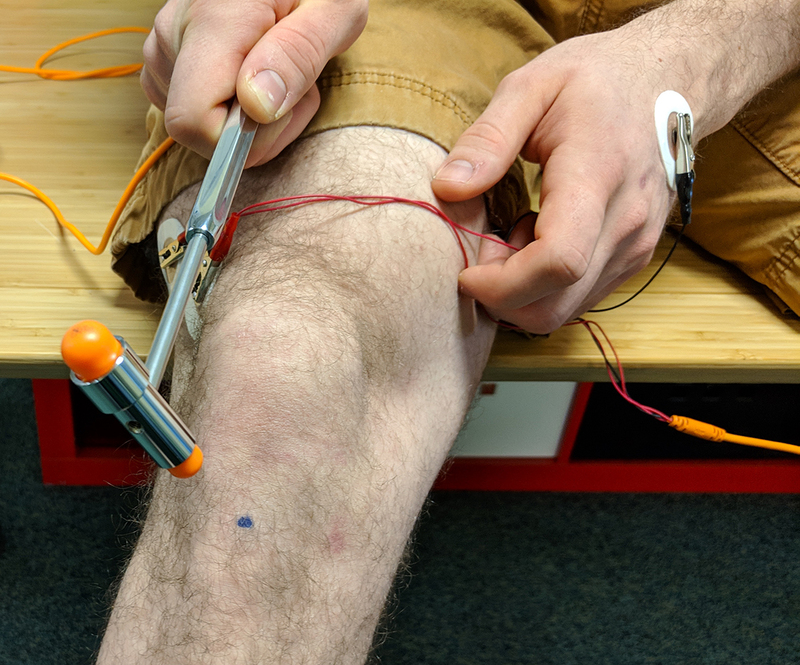 Test to see if you get a good EMG signal with a fairly small contraction by asking the subject to straighten their knee against resistance. Poor signal? Adjust the vertical zoom on SpikeRecorder. If that still doesn't help, adjust the electrode placement. Also, if you are still not getting a very clear signal, feel free to experiment with where you place the ground electrode. You can also go into the SpikeRecorder settings and set the signal threshold from 70 to 1500, and check the box by "60hz" to filter out more noise. Locate the part of the patellar tendon just below the kneecap and above where it inserts into the shinbone. The best place to tap it is just below the kneecap. If you like this person, avoid hitting the knee cap because...ouch! Use a quick, firm tap to the tendon to elicit an involuntary kick out. Experiment with small changes in location and tap force. Find the sweet spot. Congratulations! 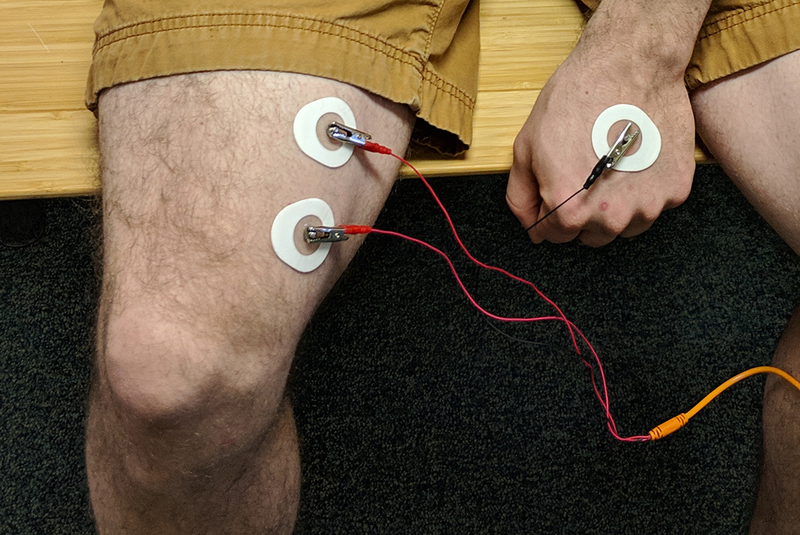 You can now record the muscular response to the Patellar Reflex. But how might we measure the time difference between when the hammer strikes and the muscle flexes? Yes! We can measure the reflex time with the Backyard Brains Reflex Hammer - an expansion kit for the Muscle SpikerBox Pro. Plug the Reflex Hammer into the Muscle SpikerBox Pro. 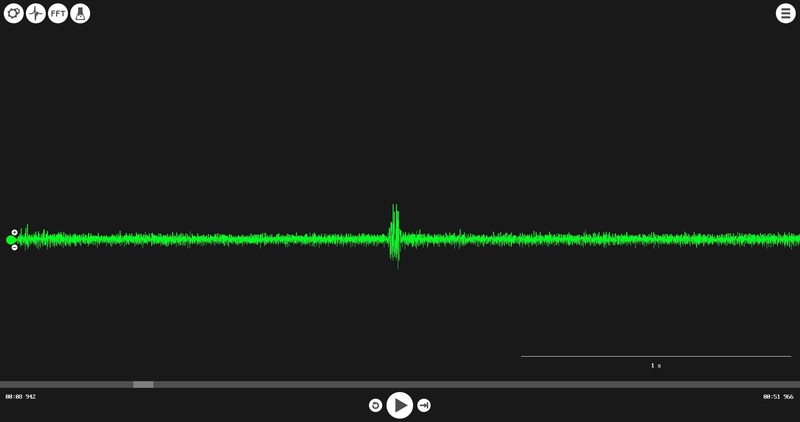 If you are connected to SpikeRecorder already, you should see a second channel appear in the recording! Give the hammer a wiggle... then gently strike it against a nearby obstacle or foe. 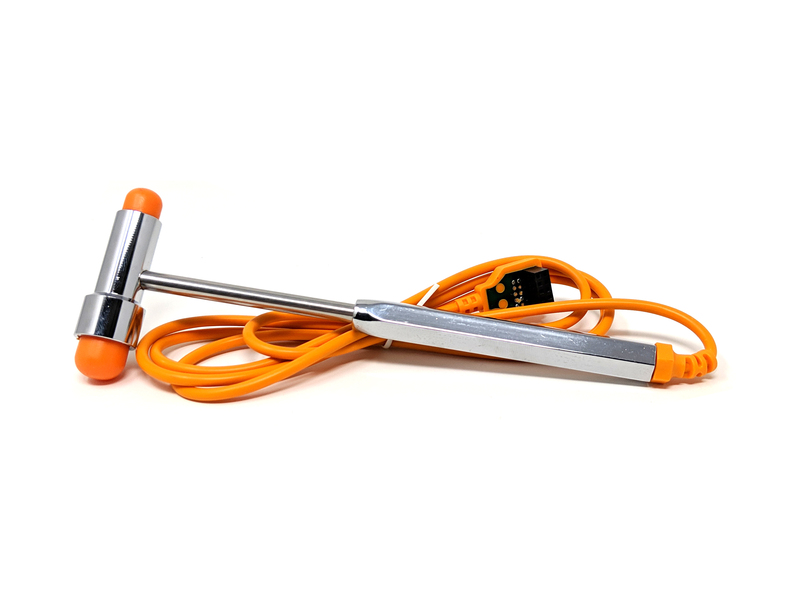 Watch in SpikeRecorder as the accelerometer in the Reflex Hammer creates great wiggles and spikes! Now, have your subject sit up high so their legs are dangling. Also, and this is important, have your subject close their eyes or look away so that they can't anticipate the hammer. Begin experimenting! Depending on how you'd prefer to describe it, give your subject some forceful taps, or gentle strikes, below their kneecap. Once you find the sweet spot, you should be able to evoke the leg-kick reflex! Zoom in with touch controls or your mouse wheel. You can measure the reflex time by measuring the difference between the spike when the hammer strikes and the muscles flex in response! 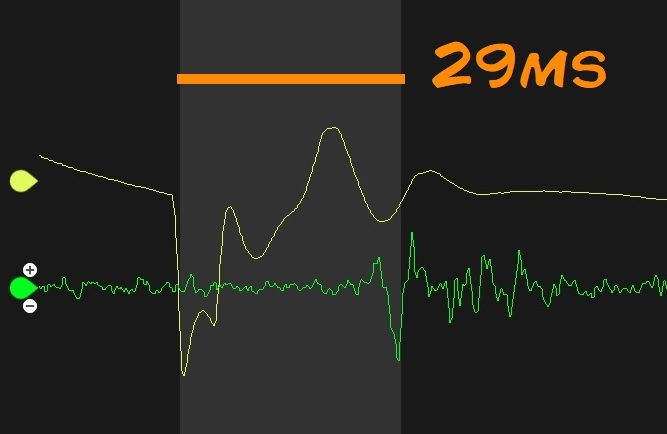 The hammer strike is when the accelerometer in the reflex hammer experiences the greatest degree of (de)acceleration, so alight the EMG recording to the earliest "vertical" mark on the accelerometer reading - see photo before. You can use the handout link above to have a form to allow you to easily tabulate the data. If you have the Reaction Timer and performed the experiment How Fast can Your Body React? 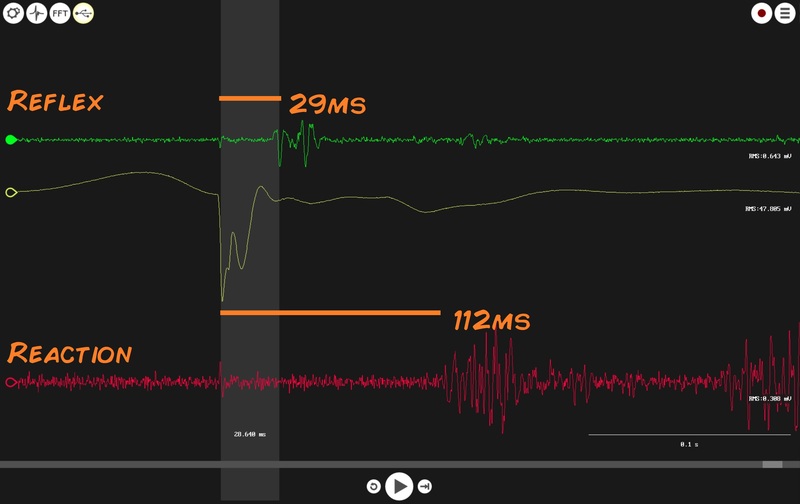 ", compare your findings and see how Reflex and Reaction times stack up against each other. Don't have the Reaction Timer? Well, you can record a simple reaction time test with this set-up too! We can measure and compare the time difference between "brain circuits" (reaction) and "spinal cord circuits" (reflex) with this setup! Use the second channel of the Muscle SpikerBox Pro to record from your other leg with the same electrode placement. Tell the research subject to close their eyes again. Tell them to kick their other leg when they feel the hammer tap the same leg you had recorded from previously. Still having trouble? Try positioning the electrodes even further onto the lateral or medial sides of the leg. If you are plugged into a wall outlet, go into the settings a check the box that says "60hz" to filter out electrical interference. Make sure your hammer isn't hitting one of the red wires! What are some other reflexes you think you could test? 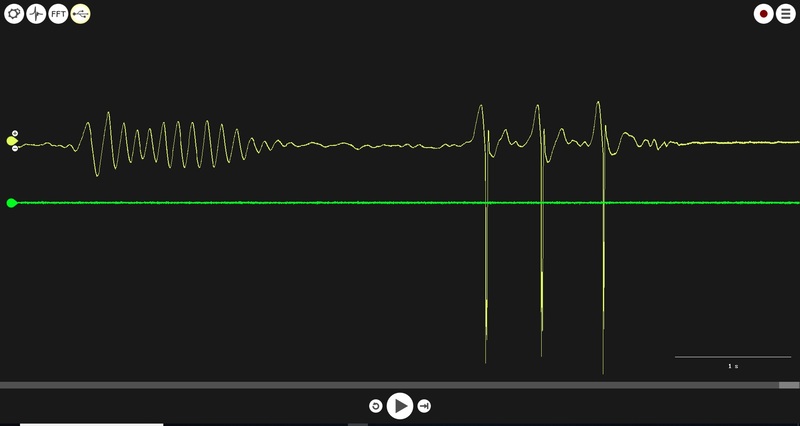 Does the speed/amplitude of the response change depending on the state someone is in? For example, if they are tired, have a lot of energy, had coffee recently, etc. Why do you think these do or don't affect the reflex? Don't hurt yourself or anyone else investigating this, but does the speed or amplitude depend at all with the force you strike the knee with? Why might this be or not be? For this experiment, the person having their reflex activated normally keeps the leg relaxed, but what if they try to resist the reflex? Does that affect the speed or amplitude at all, or does the reflex even happen? Why might this be? We have noticed two things worth further examination. The reflex time tends not to be very variant in a single person during a session (always +-2 ms), but the reflex time between individuals can range from 13 ms to 35 ms. Since this is an unconscious reflex, what may be the reasons for such variability between individuals? Age, fitness, athletes (runners vs weightlifters, etc) may all be factors. Also, the reaction component tends to be more varied trial to trial within a person (from 130 - 200 ms), as this requires conscious control and "attention" which increase time variability between trials. Start collecting data from all the people you know!